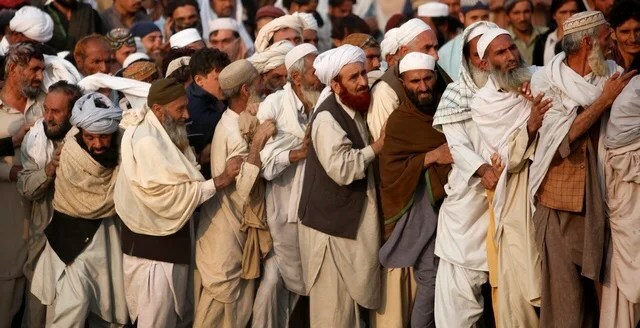 Although the government claims military offensive against Taliban in South Waziristan has succeeded in securing the area, the displaced people are reluctant to go back to their homes, saying militants had only dispersed, not wiped out, during the operation. South Waziristan, the restive tribal belt bordering Afghanistan, is considered traditional stronghold of militants not only belonging to defunct Tehreek-e-Taliban Pakistan (TTP) but also to Afghan Taliban and al-Qaeda. Foreign affiliates such as groups of Uzbeks, Chechens and Tajiks are also there. Four major military operations have been carried out in South Waziristan to clear the area from the Taliban militants since 2004. The most recent offensive — Operation Rah-e-Nijat (Path to Salvation) — was started in October last year, and is still going on. Around 400,000 local residents, largely belonging to Mehsud tribe, were displaced from the area due to this operation. Government officials claim that the area is now completely cleared from militants and now they are sending displaced people back to their homes. But the locals are unwilling to return to their villages as they fear the militants are either hiding in mountains of the area or have escaped to adjacent tribal areas. Most of the displaced Mehsuds, whom TNS spoke to, were not yet ready to return due to fear of security situation, damage to their houses, lack of livelihood opportunities, electricity, food and other facilities. “It is very dangerous. If we go back to our homes, militants will be there because they are still alive and have just moved to neighbouring tribal areas,” says Munsif Mehsud, one of the displaced people who declined to go back. He had brought his extended family of 18 to Karachi and lives in a rented house in a slum near Super Highway. The displaced families said it was the fourth time they had been displaced from their homes due to operation against the militants. “The government wants us to be taken back to our homes in military conveys. This will create security problems for us as the militants will link us with the government,” says Zafar Mehsud, another displaced person who lives in district Tank. Three weeks ago, TTP’s militants kidnapped 23 tribesmen, who were members of a committee of displaced persons, for attending a function arranged on the occasion of December 7 visit of chief of army staff to Makeen and Ladha areas of South Waziristan. “This is a warning to the tribal people not come to the area because we are still present in South Waziristan,” Azam Tariq, spokesperson for TTP, told the media recently, claiming that militants had seven Taliban courts functioning in the area, as well as 22 offices. Later, the militants freed the kidnapped tribesmen. This kidnapping further threaten the government’s shaky attempts to persuade Mehsud tribesmen that the militants are defeated and that it is safe to go back to their homes in South Waziristan. Maulana Saleh Shah, a senator from South Waziristan, when contacted by TNS, also admitted that the government had just cleared very few areas of South Waziristan which are near to FR Jandola. “Most of the area is still not declared clear from the militants by the security forces,” Shah says, adding that only the people hailing from some villages, including Chagmali and Kotkai, were returning. According to Duniya Aslam Khan, a Public Information Assistant at the UN Refugee Agency (UNHCR), the government has declared 13 villages to be safe to return which are located in the lower parts of South Waziristan where weather is fairly mild in the winter. “Returning to their homes is a voluntary process and we can’t say how many people will return,” Khan says. The military had declared victory over militants in South Waziristan in February last year but is since struggling to convince the refugees to go back to their homes. Experts opine that the unwillingness of displaced families to go back also highlights the difficulties the security forces face in maintaining security in the region months after they have declared victory. A local Mehsud journalist, requesting anonymity, says the government was trying to form Mehsud lashkars (militias) or peace committee, like already formed in Bajaur and other tribal areas with support of the government. But elders of Dray Mehsud (three clans of Mehsud) were clearly refusing it from the beginning. A few days ago, TTP spokesperson Tariq, while talking to the Associated Press, warned that his group will take severe actions against those who form such lashkars or peace committees to take on the militants. The government has promised to give returnees a cash stipend, living essentials and assistance for rebuilding homes damaged or destroyed in the fighting, but the slow pace of compensation and reconstruction in Swat will not give Mehsud tribesmen much confidence on those claims. “UNHCR is assisting with logistical arrangements (having set up transit centres, registration desks, hot meals, etc) and shelter support for those choosing to return as well providing transports to the returning families from Dera Ismail Khan and Tank districts to their villages in South Waziristan,” Khan says, adding that Fata Disaster Management Authority (FDMA) is giving Rs25,000 to each family. Senator Shah also complained that the government had also not fulfilled the promises of giving compensation to those going back because all the houses and businesses were totally destroyed in the area. Most of the Mehsud families said that with their home destroyed, they were ready to live in tents because of cold weather. It is pertinent to mention that unlike refugees hailing from other tribal areas who lived in tents in the camps, most members of the Mehsud tribe are staying with relatives or in rented houses in Dera Ismail Khan, Tank and Karachi. “The government has offered compensation of just Rs25,000 per family for damage to their houses and other losses which is not sufficient,” says Sher Alam, a refugee living in Peshawar. Senator Shah says he has demanded the federal government to increase the relief amount to Rs100,000.